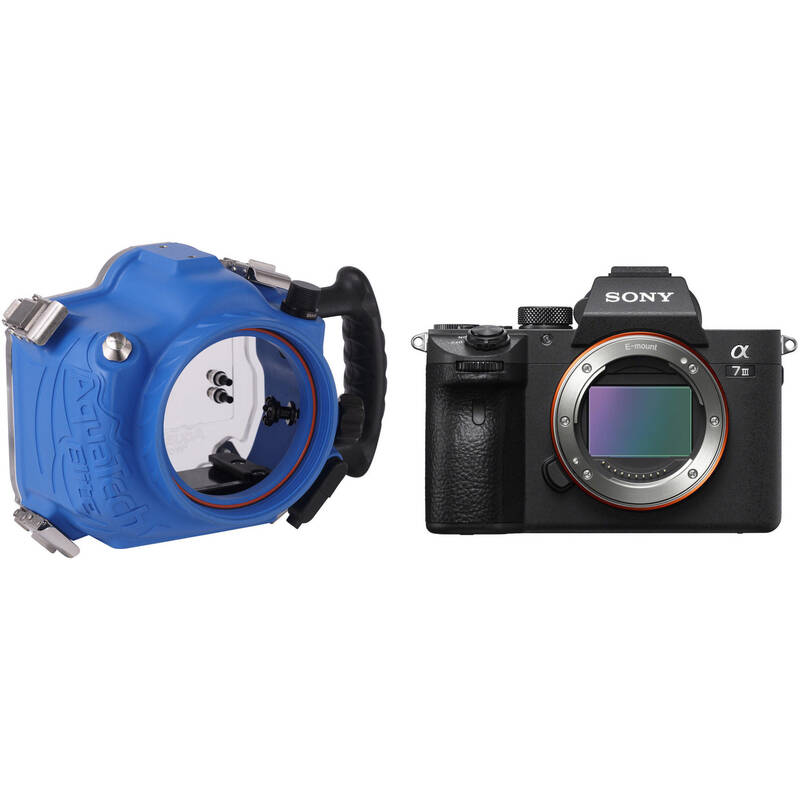 Capture 24MP photos and 4K30 video underwater with this AquaTech Elite Underwater Housing and Sony a7 III Mirrorless Camera Kit from B&H. The housing is depth-rated for 33' and offers ready access to the camera controls. The a7 III body offers a full-frame Exmor R BSI CMOS sensor, a BIONZ X image processor, and shoots up to ten frames per second. Once you grab your favorite lens, the appropriate port, and a strobe or video light, you'll be ready to start your dive. Capture images over, under, or near the water's surface with your Sony A9, A7RIII or A7III Mirrorless Digital Camera in AquaTech's dedicated Elite A9 Water Housing, which features a depth rating of 33'. Mechanical controls afford easy access to important camera functions, while an ergonomic side grip improves handling and comfort. An optional Pistol Grip Trigger and Pole Shutter Extension will enable remote firing capability and focus control, allowing you to capture blur-free images with ease. The pole will also give you extra reach when shooting at certain angles. Built for durability, the housing body is constructed from corrosion-resistant polyurethane and the controls are made of stainless steel, anodized aluminum, and high-strength plastic. Together, the quick release clips with safety latches and the O-rings ensure that the Elite A9 remains watertight to keep your camera and lens safe. A threaded 3/8"-16 mounting point at the bottom of the housing enables connection to an optional tripod or tray. The enclosure ships without a required lens port, and accepts a series of interchangeable ports for various lenses. For complete compatibility details, see the P-Series Port Chart. Box Dimensions (LxWxH) 10.7 x 8.3 x 6.3"